Overlooking rolling hills covered in vineyards with the snowcapped Andes in the background; that’s how we started our day off in Colchagua Valley, Chile. After working at the lodge for 5 days, doing everything from cutting and hauling firewood to devising a marketing strategy to sell private vineyards, we got a day off and took it upon ourselves to get to know the wine country surrounding us. 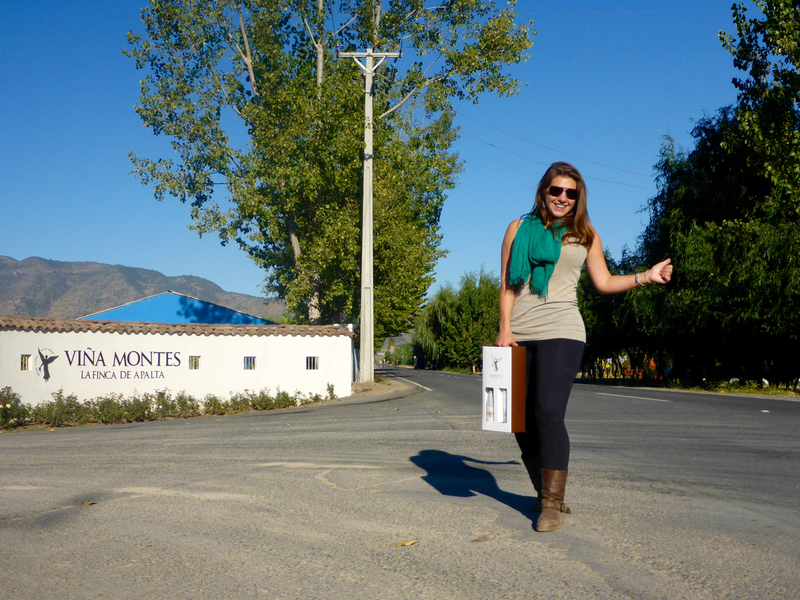 The Colchagua Valley is the up and coming wine mecca of South America. It has a few established wineries, but is really coming into it’s own now and getting a lot of buzz and awards – becoming Chile’s version of Napa. But, of course, this wasn’t exactly the Napa experience we had last year for my 30th birthday. For one, the Colchagua just isn’t that fancied up yet. Moreover, we fall into the cheap backpacker category of wine touring now – which means no private driver, no VIP treatment, not even a rental car. To get to the first winery, we had to catch a ride with someone from the lodge into the small town near by, then walk about a mile to the bus station, where we caught a locals bus to Santa Cruz. From there, we negotiated for a taxi to drop us off at the first vineyard LaPostolle. The winery had amazing views of the valley and felt like we were walking into a giant art sculpture. The building itself is beautiful. It’s shaped like a modern art wine barrel, with a beautiful deck and granite everywhere. They left in a part of the natural granite mountain inside when they excavated the mountain, which is not only gorgeous, but made the winery stable and survive the massive earthquake that hit Colchagua in 2010. The winery is French owned, and all of the wines are styled that way. The tasting room is out of this world! Perfectly polished walnut lines the rounded ceiling, which is studded with twinkling lights, under the huge glass tasting table is the entrance to the owners private wine collection of over 6,000 bottles. 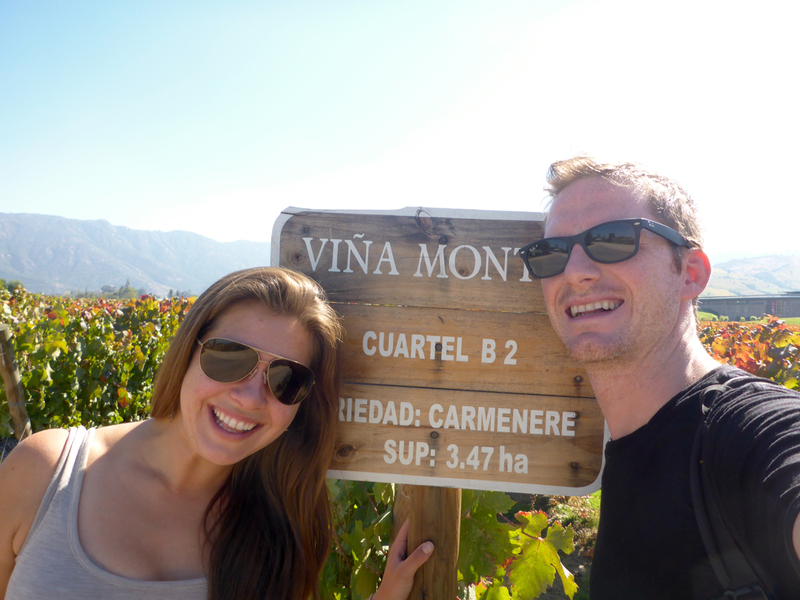 Throughout our LaPostolle tour we kept asking ourselves how in the world there was this fancy of a winery in Chile. I mean there are great, amazing wines in Chile, but its just not that upscale of a style. Let’s say it’s more Sonoma than Napa… or more like Texas Hill Country than Napa (not the wine, but the wineries, service, atmosphere). Why and how did this winery exist here?! Well, at the end of our tour, we got our answer in the gift shop. Along with telling us about all of the different LaPostolle wines they sold there, our guide mentioned that they also sell Grand Marnier in the gift shop… because the owner of the winery owns Grand Marnier. Mystery solved! 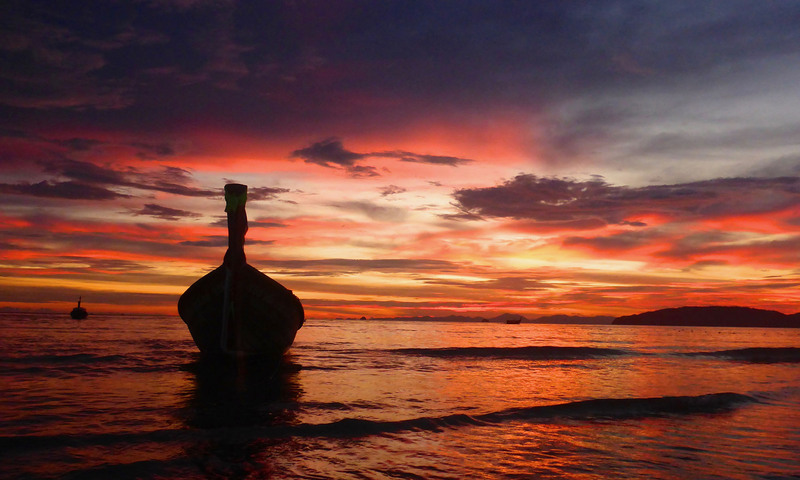 From here our transportation got a bit more adventurous…. Taxis don’t pick up at vineyards, so we were on our own to figure out the next step. Fortunately, a kind couple from Colorado took pity on us (after the winery informed us it was an hour walk to the next closest winery) and we bummed a ride to the entrance of Montes Winery where we didn’t have a reservation of course, and the security guard reluctantly let us in after radioing back to base, then was a bit flabbergasted when we got out of the car and the car drove off and we asked which way to walk for the tour. After a short 20 minute walk up the drive way we found a lovely restaurant. Perfect timing – as we were ready for some lunch. We asked for a tour in English and since we were the only English-speaking people around, it became a private tour, SCORE! Our serendipitous private tour involved a carriage ride up to hillside through the vineyards talking terrior, hectors and new French oak. 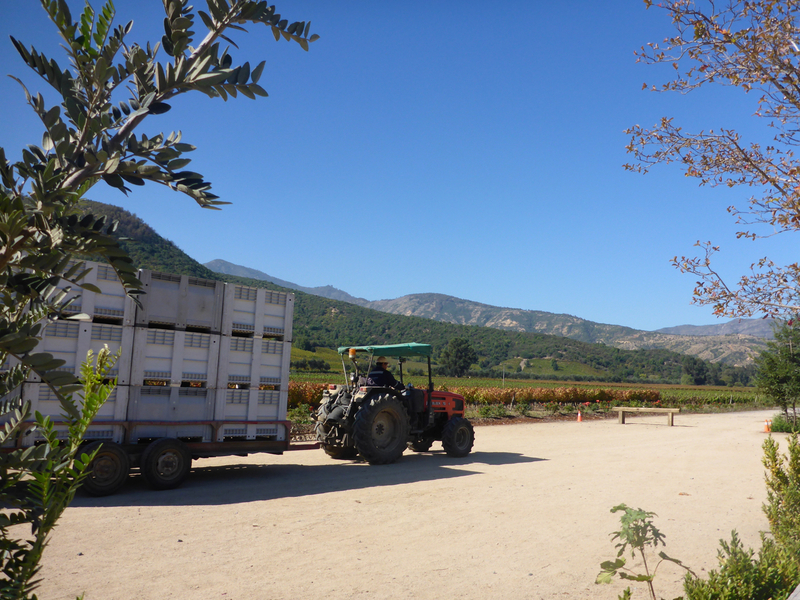 After a brief stop at the mirador at the top of the hill it was on to the see the harvest in process. And then onto Rick’s favorite part of just about any winery, the fermentation room, followed by the cellar where we had our tasting. The tasting was amazing. As we were almost finished another tour guide came in and said she had 2 glasses of the top of line wines that had been breathing for a private reserve, extra special, VIP tasting that didn’t show… So the offered it to us! DOUBLE SCORE! After that tour, we were again stuck. So I got to try my hand at hitchhiking again – this time with SUCCESS!! Rick was a bit dumbfounded as he thought I was joking about hitchhiking and after less than a minute, a very kind Chilean guy pulled over to pick us up, he worked at another winery and we chatted all of way to the Santa Cruz bus station. Where we proceed to board the public bus back to our tiny town, with our bottles of wine, to arrive after dark and wander around town negotiating with taxis to drive us 40 minutes out to the lodge area… where we would get dropped off and have a kilometer walk. It was quite an adventure… let’s just say it was no Cadillac Escalade waiting for us with a bottle of Champagne, but it was charming, delicious and adventurous – and we wouldn’t have it any other way!